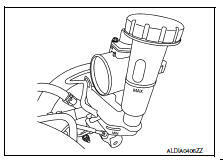 Make sure that the brake fluid level in the reservoir tank is between the MAX and MIN lines. Visually check around the reservoir tank for brake fluid leakage. If the brake fluid level is excessively low, check the brake system for leakage. If brake warning lamp remains illuminated after parking brake pedal is released, check the brake system for brake fluid leakage. Check brake line (tubes and hoses) for cracks, deterioration or other damage. Replace any damaged parts. Check for brake fluid leakage by depressing brake pedal under a force of 785 N (80 kg-f, 177 lb-ft) for approximately 5 seconds while engine is running. If brake fluid leakage occurs around joints, retighten or replace damaged parts as necessary.